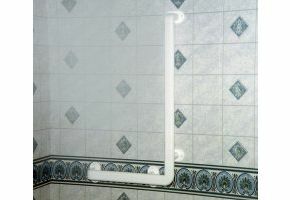 Ashby Shower Kit - High Quality Plastic Grab Rail Kit. This high quality plastic grab rail kit has been specially designed for use in both a shower cubicle and a shower situated over a bath. Non-slip, the rail has moulded ribs for extra grip and is ideal for when extra leverage, support and safety are required. Attractive purpose-designed for elderly and disabled people, the rails are never cold to the touch. The kit consists of three separate components (two rails and a 90º corner piece).